It can be a disconcerting thing to stand in Nova Scotia’s Margaree River Valley on a clear August night. For if it’s possible anywhere to inhale the distilled essence of a single place, it is here, where even a jaded city dweller can experience Cape Breton Island’s peculiar soul and overwhelming grace. …Just the ticket in other words, if you’re looking for a laid-back place…The Margaree River – gorgeous enough to grace a Canadian stamp – sets the tone. 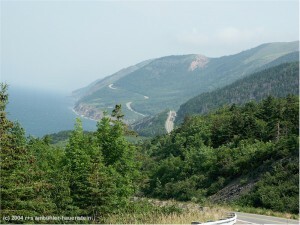 Its pristine waters weave past hamlets like Upper Margaree, South West Margaree, North East Margaree, Margaree Forks and plain old Margaree before reaching the ocean at picturesque Margaree Harbour. Enjoy an old-fashioned Ceilidh (folk music and storytelling party; social event with singing and dancing to traditional Scottish or Irish music and storytelling). Hiking: choose from rolling hills and dales along the meandering Margaree River, or a spectacular coastal hike with panoramic seascapes at every turn. Or, explore remains of gold mining, hike to a waterfall, etc. Salmon Fishing on the world-renowned Margaree River. Visit the Margaree Salmon Museum. Beachcomb, swim, frolic in the waves, or just soak up the sun on one of 4 golden beaches nearby. Shop for local crafts or pottery. 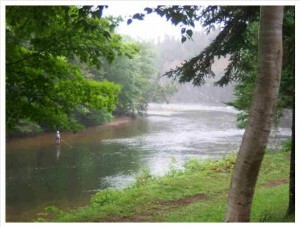 Canoe the Margaree River or Lake O’Law. Sit on a wharf and just watch the fishing boats come and go. Hiking in the Cape Breton Highlands National Park. Golfing at your choice of many great golf courses including the newly opened Cabot Links. Day trip to Sydney for cultural events and shopping. Day trip to Louisbourg to explore Fortress of Louisbourg or take in some entertainment at the Louisbourg Playhouse. Trip to the picturesque village of Baddeck with its many sites such as the Alexander Graham Bell Museum.